In the previous post I discussed some common back pain myths, such as the ideas that bulging discs, “bad” posture, or lack of core strength are major causes of back pain. As I noted, the evidence just doesn’t support those claims, and this is somewhat surprising and counterintuitive. However, learning some basics of pain science will go a long way towards making this evidence more understandable. Pain science has learned a great deal in the last fifty years, but most of this information has had seemingly little impact on the way pain is commonly treated. If you have pain, this is stuff you should know. By the time you are done reading this post you will know more than many medical providers about pain mechanisms, and maybe even feel a little better as a result, because research shows that pain education can improve outcomes. Here are some basics ideas of pain science. Pain is defined as an unpleasant subjective experience whose purpose is to motivate you to do something, usually to protect body parts that the brain thinks (rightly or wrongly) are damaged. If you feel pain, it means that your brain thinks the body is under threat, and that something has to be done about it. In this sense, pain is a survival mechanism of fundamental importance. People born without the ability to feel pain (yes, they really exist) don’t live very long. Your nervous system takes its job of creating pain very seriously, and therefore you can expect that when it thinks a part of the body is being damaged, it will err on the side of giving you a clear incentive to do something about it. This is the fundamental paradigm shift that has recently occurred in pain science. Pain is created by the brain, not passively perceived by the brain as a preformed sensation that arrives from the body. When a body part is damaged, nerve endings are triggered and send warning signals to the brain. But no pain is felt until the brain interprets this information and decides that pain would be helpful in some way - for example to encourage protective behaviors to minimize further damage and allow time for healing. The brain considers a huge amount of factors in making this decision and no two brains will decide the same thing. Many different parts of the brain help process the pain response, including areas that govern emotions, past memories, and future intentions. Therefore, pain is not an accurate measurement of the amount of tissue damage in an area, it is a signal encouraging action. When a professional musician hurts his hand, his brain might consider very different actions than a soccer player with the same injury. And therefore you can believe that he may get a very different pain response. 3. Physical Harm Does not Equal Pain. And Vice Versa. If you are in pain, you are not necessarily hurt. And if you are hurt, you will not necessarily feel pain. A very dramatic example of tissue damage without pain occurs when a solider is wounded in battle, or a surfer gets an arm bitten off by a shark. In these situations, there is a good chance the victim will not feel any pain at all until the emergency is over. Pain is a survival mechanism, and in cases where pain makes survival even harder, we shouldn’t be surprised that there is no pain. Although most of us have never had our arms bitten off by sharks, we have likely experienced bumps or falls during a sports match or some other minor emergency that we didn’t feel until the game was over. Further, many studies have shown that large percentages of people with pain free backs, shoulders and knees have significant tissue damage in these areas that can be seen on MRI, such as herniated discs and torn rotator cuffs. On the other hand, many people suffer from pain when there is no tissue damage at all. Allodynia is a condition where even normal stimuli such as a light touch the skin can cause excruciating pain. This is an extreme example of something that might occur quite commonly on a much smaller scale – the nervous system is sensitive to potential threats, and sounds the alarm even when no real threat is present. There are many other more commonplace instances where the brain does not know what is going on in the body and causes pain in an area that is clearly not under threat. Any kind of referred pain, where pain is felt a distance from the actual problem is an example of this. Allodynia is another example. One unfortunate aspect of pain physiology is that the longer pain goes on, the easier it becomes to feel the pain. This is a consequence of a very basic neural process called long term potentiation, which basically means that the more times the brain uses a certain neural pathway, the easier it becomes to activate that pathway again. It’s like carving a groove through the snow while skiing down a mountain - the more times the same path is traveled the easier it is to fall into that same groove. This is the same process by which we learn habits or develop skills. In the context of pain, it means that the more times we feel a certain pain, the less stimulus is required to trigger the pain. You may have heard the phrase that neurons that fire together wire together. The most famous example of this principle is Pavlov’s experiment where he rung a bell each time his dogs ate dinner, then later found that he could cause the dogs to salivate at the mere sound of the bell. What happened at the neural level is that the neurons for hearing the bell became wired to the neurons for salivating, because they fired together consistently for some time. The same thing can happen with pain. Let’s say that every time you go to work you engage in some stressful activity such as working on a computer or lifting boxes in a way that causes back pain. After a while your brain will start to relate the work environment to the pain, to the point where you can start feeling the pain just by showing up, or maybe even just thinking about work. 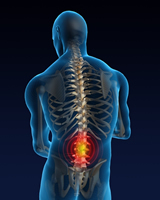 It is no surprise that job dissatisfaction is a huge predictor of back pain. Further, it has also been shown that emotional states such as anger, depression, and anxiety will reduce tolerance to pain. Although it is hard to believe, research provides strong evidence that a significant portion of chronic back pain is caused more by emotional and social factors than actual physical damage to tissues. You may have noticed that when you return to a place you haven’t been for many years, you quickly fall back into old patterns of speech, posture or behavior that you thought you had left behind permanently. Pain can be the same way, getting triggered or recalled by certain social contexts, feelings or thoughts that are associated with the pain. Ever notice that your pain went away went you went on vacation and came back when you returned? There are numerous mechanisms by which the CNS can increase or decrease its sensitivity to a stimulus from the body. The most extreme example of desensitization occurs during an emergency situation as described above, when pain signals from the body are completely inhibited from reaching the brain. Most of the time an injury will increase the level of sensitization, presumably so that the brain can more easily protect an area that is now known to be damaged. When an area becomes sensitized, we can expect that pain will be felt sooner and more strongly, so that even normally innocuous mechanical pressures can cause pain. There are many complicated mechanisms by which the level of sensitivity is increased or decreased which are far beyond the scope of this article to address. For our purposes, the key point is that the CNS is constantly adjusting the level of volume on the pain signals depending on a variety of factors. For whatever reason, it appears that in many individuals with chronic pain, the volume has simply been turned up too loud and left on for too long. This is called central sensitization, and it probably plays at least some role in many chronic pain states. It is another example of how chronic pain does not necessarily imply continuing or chronic harm to the body. When the body is working well, damaged tissues will heal to the best extent possible in a few weeks or months, and then pain should end. Why should it continue if the body has already done its best to heal it? When pain continues for long periods of time without any real source of continuing harm or damage, there might be a problem with the pain processing system, not the body. Put another way, if you have chronic pain, there is at least some chance that you are not really hurt. Research shows that for some people this is a comforting thought, and serves to reduce anxiety and stress and threat that makes pain worse. So what else can we do with this info to help get out of pain? The bottom line is that we need to figure out what is causing the CNS to feel threatened and how can we reduce the threat. In the next post I’ll discuss some specific strategies based around movement. And get news, updates and a Free Report on How to do Joint Mobility Drills.